Xanthelasma is a medical condition where yellow cholesterol particles are deposited in the eyelid skin. It is not necessarily an indicator of high levels of cholesterol in the blood, but can be of a cosmetic concern to those affected. Individuals affected by this condition may have a genetic predisposition. What are the treatment options available ? Treatment of Xanthelasma is a quick and relatively pain free procedure. The area to be treated is first numbed with local anaesthetic solution to prevent any discomfort associated with the treatment. Radio-wave, Erbium or Carbon dioxide laser is then used to ablate (evaporate) the xanthelasma down to skin level. Treated area remains red and slightly swollen for a few days. Most patients heal within 5 to 10 days time. It is possible for xanthelasma to return in the same area or another area even after treatment. 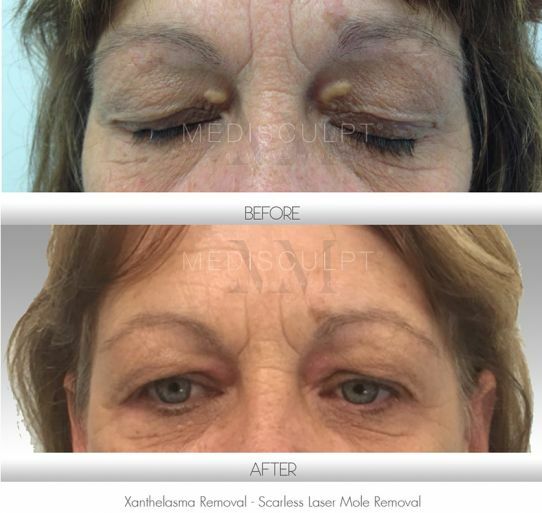 This is one of the main reasons why we do not advocate surgical removal of the xanthelasma as it can leave a scar and further surgical excisions may end up in excess skin removal. With laser or radio-wave, the treatment can be repeated without the removal of skin.